ISIS has returned to the strategic Syrian border town of Kobani, whose Kurdish forces managed to drive out the terrorist group with the help American air strikes earlier this year. 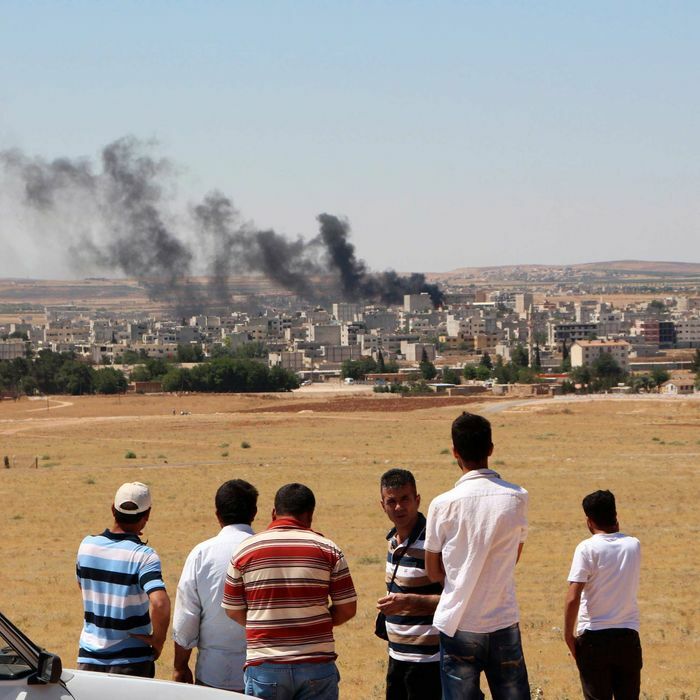 Witnesses said that Islamic State fighters entered Kobani early Thursday morning, having disguised themselves as members of the anti-government Free Syrian Army. The militants then detonated a truck bomb near the town’s crossing with Turkey. “At least one more bombing followed, reportedly a suicide attack by a jihadist on a motorcycle,” the New York Times reports. “And Islamic State fighters were said to be blowing themselves up with explosive vests and killing civilians.” Kurdish forces (known as the YPG) are reportedly fighting ISIS throughout Kobani. [A YPG spokesman] said Kurdish fighters killed 30 of the attackers. Pictures posted on social media showed at least one dead man in uniform who was said to be an Islamic State fighter. [The Syrian Observatory for Human Rights] said least 35 people, most of them civilians, were killed in the attacks, as well as 20 or more Kurdish civilians in a village south of Kobani. A YPG Facebook page said at least 15 Islamic State fighters had been killed. A doctor in the town, Welat Omer, said 15 people had been killed and 70 wounded, many of them seriously. Some had lost limbs and some of the wounded had been taken to Turkey. Syrian state TV reported intense clashes inside [Hasaka’s] southern neighborhood of Nashawi. According to the report, IS fighters killed several people they captured in the city, including the head of a military housing institution. It said the militants sustained many casualties, including the commander of the group, who is a foreign fighter. An activist group said many people in neighborhoods engulfed in the fighting fled to safer areas in the city. IS tried to storm the city earlier this month and reached its southern outskirts before facing strong resistance from Syrian government troops who pushed them away. Reuters reports that the United States responded to the Islamic State’s presence in Hasaka with air strikes.